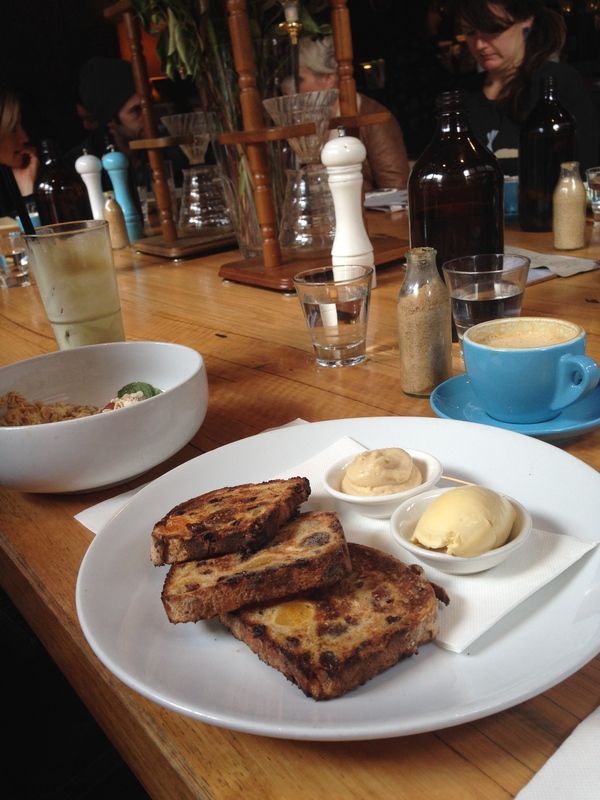 i dragged the husband out for a well overdue #walkandbrunch on sunday and after seeing on instagram this week that proud mary in collingwood were now serving almondmilkco decided this was where we were heading. 4.9km later with a lovely walk through treasury gardens and across into the converted warehouse district of collingwood, we were in the line with very hungry tummy’s. 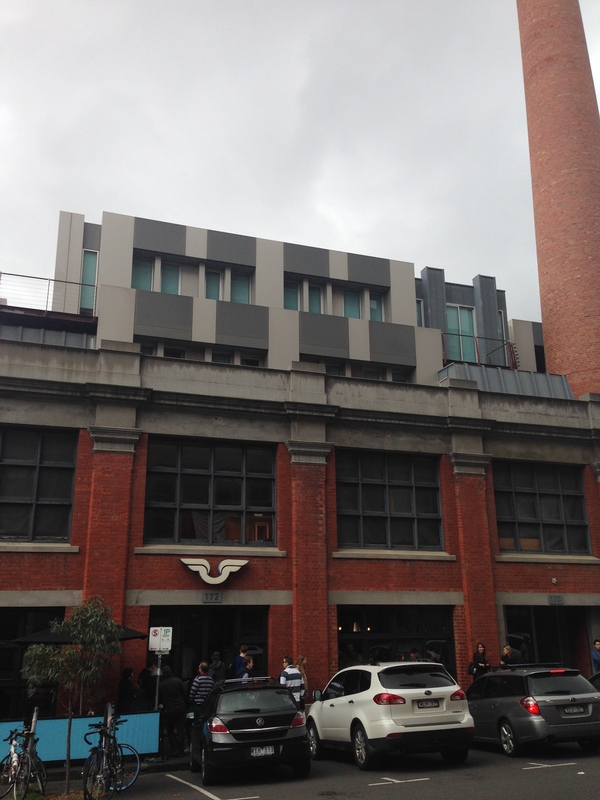 the place was packed – a great noisy vibe – but thankfully only a 15 minute wait. 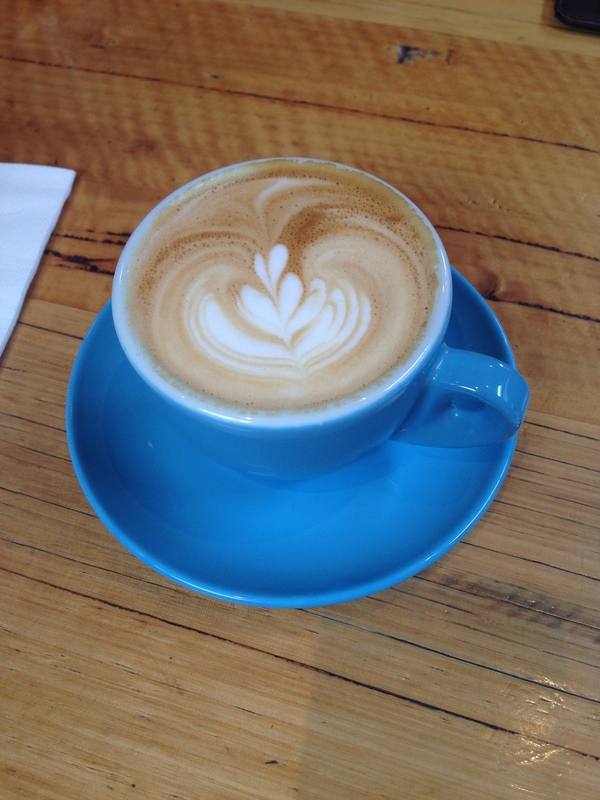 first stop… almond milk latte. this was definitely the best almond milk latte i’ve had, and while it had settled by the time it got over to my table, it re-stirred and blended together well again and didn’t taste at all watery like many i’ve had previously. 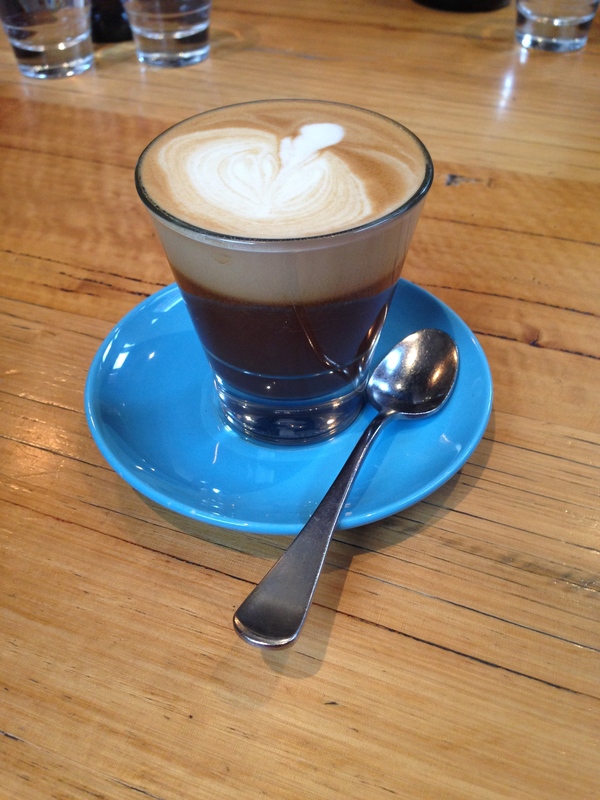 the coffee itself was strong, robust and complimented the nutty milk well. 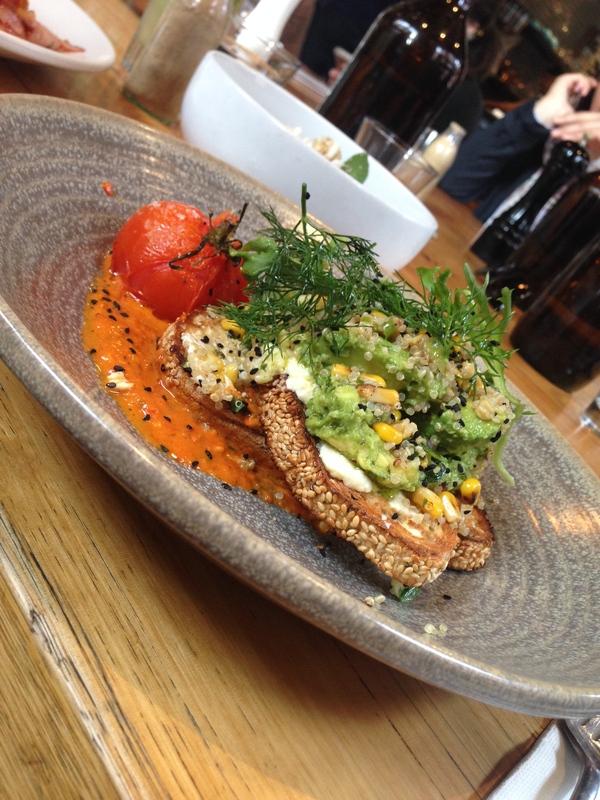 avocado on seed + sprout toast, charred corn + green onion tabouleh, house ricotta, harissa + roast baby tomato. this was delicious and so incredibly filling. the toast was actually great (not just a side thought that i usually don’t eat), and the avocado + corn topping was delicious. grilled corn = winner (if you’ve seen my post on manchester press this was one small criticism i had of their avocado + corn bagel). roast tomato was perfectly cooked + i loved the dill – an under-utilised but one of my favourite herbs. however, the absolute best part was the harissa sauce – adding some chilli to the dish and really trying everything together … genius. 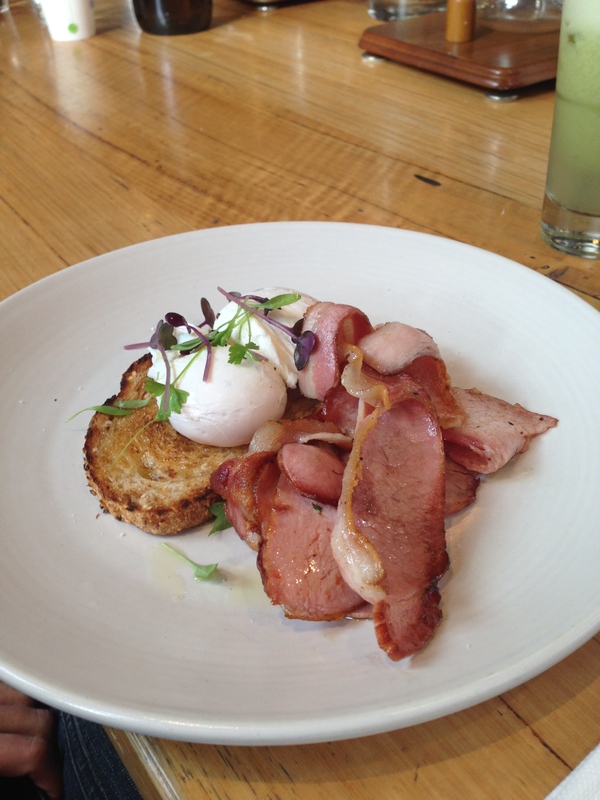 poached eggs + bacon – soft, runny yolks and good quality bacon. husband was happy. 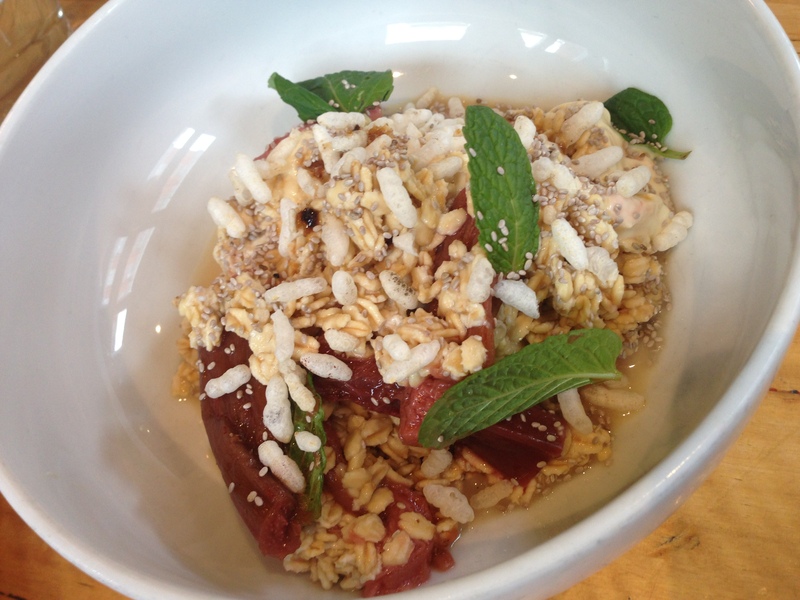 it seems every bircher ordered in melbourne comes with stewed rhubarb at the moment, but trust me i’m not complaining! i love this winter fruit, especially when teamed with porridge, granola or in this instance bircher. the touch of mint flavour was lovely and the crunchy puffed grains (rice bubbles) added some great texture. all in all, a pretty good bircher. fig + apricot toast with citrus mascarpone + creamed honey. i used to buy this toast on a weekly basis from the eumundi markets when we lived in qld – it is (in my opinion) the best fruit toast out there with delicious chunky fruit pieces. i loved the creamed honey served with this and the mascarpone was a bit of a weekend indulgence. we did have a small incident though, which left me a little disappointed. i originally wanted to try the haloumi breakfast but unfortunately was told they were sold out for the day. understandable given it was just past noon, and i was happy enough to move on to my 2nd savoury option (the avocado). our next preference was to share the ricotta hotcakes as we had major food envy watching four others around our big table devour this delicious-looking dish (served with gooey mandarin caramel, honeycomb + ice cream). again told they were sold out for the day, and we settled for the bircher. i moved on and would’ve been ok if it had been left at that. 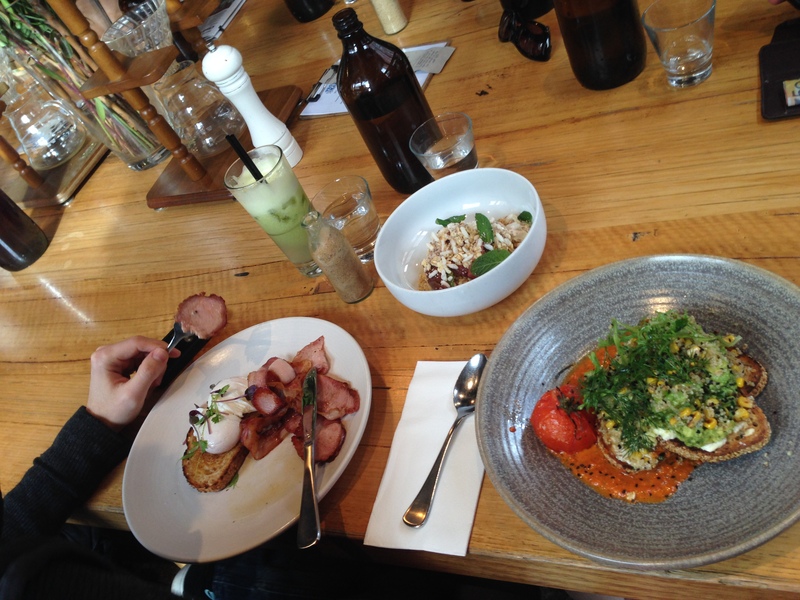 that was, until the girl opposite us ordered the … “ricotta hotcakes!”. given the sold out notice i’d received just 5 minutes earlier, i expected to see the wait staff come back to profusely apologise that there were none left… but no, a short while later she was delivered her dish of delicious looking ricotta-hotcakes! i don’t know if it was mis-communication by the floor staff or issues in the kitchen but it didn’t send a great message (insert annoyed face here). i don’t want the sold out hotcakes to undermine the enjoyment that i did have – the food and coffee really is as fantastic as the reputation that the proud mary name carries – but next time i’m told something is sold out, i’ll be double-questioning it before settling for a 2nd preference. Always packed when i try to go.